So, in 2017 the median distance from home to college was 192 miles. This. Is. Not. A. Poor. Little. Arkiesaw. Post. I hate that crap. I just found it interesting as it pertains to Arkansas and recruiting and distance from extremely fertile recruiting grounds. That's all. good info. look at what happens if we can cast that net from 192 to 280 tho. For the Hogs, that 280-mile radius is the key. Then we get St Louis, Dallas, Memphis, KC, OKC, Tulsa, LR , witchita, and shreveport . I see 8 major cities close to that radius. Not bad if you ask me. It's not bad, I agree. The problem is that our competitors are much closer to most of those major cities. Good find Ego. Just means we have to work a little harder. I need help with my footwork, too. Remember that median is the middle value separating the upper half from the lower half. It would be interesting to see the same illustration for each SEC school. Nadine Coyle shakin it for the Hogs!!!! Did I miss the link to this? I'd like to see how it relates to other SEC schools. Here's a link to the site that produced this information. I definitely would've preferred the mean to the median. I know next to nothing about statistics and won't pretend like I do, but I wonder how different the average distance would be from the median distance. And I did try to do the same for each school because I was interested in that as well. I just couldn't figure out how to change the color of each different circle, so it was a bunch of overlapping green circles lol. I disagree which is why 18-35 is our recruiting ability unless we have a huge crop of in-state studs like 08, even then it took until 2012 for the ranking people to come back and say that was a top 10 class. No problem. Also, this isn't the prettiest, but here are the radii for the 7 SEC West schools. Clicking the image zooms in a little bit. 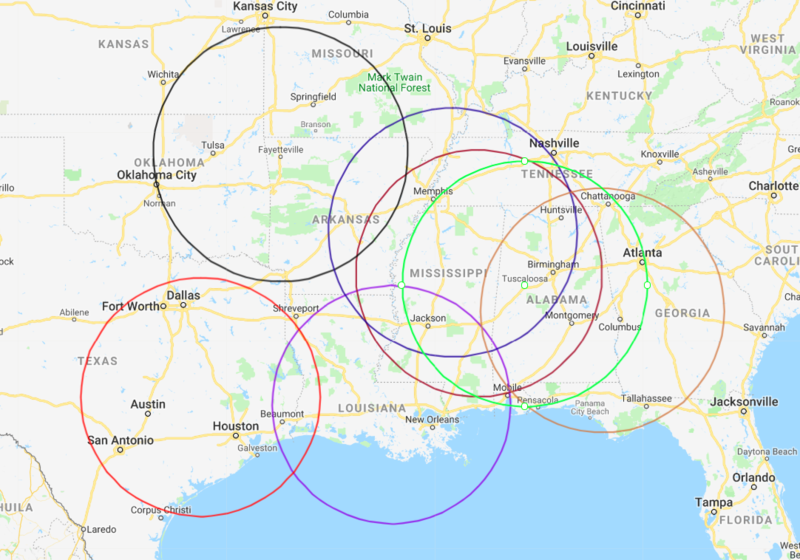 My only point on median is that, on average, half of SEC recruits come from outside the 192 mile radius, which means we are in good shape in the major metro areas just outside of it. The best years are when the half inside are best - like 2008 and 2005. Dang. 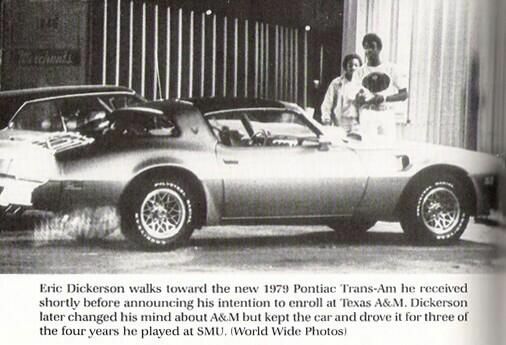 Check out A&M. How have they always screwed that up? It would make so much difference if Little Rock and Fort Smith were producing but alas that’s a broken record. Also I don’t think the 192 mile radius means much in terms of NE Texas going forward under Morris...at least that’s a hope. All around poor management. I think they made another mistake in getting Fisher also. They are a dumb program. I guess that would depend on your definition of major city. Only A&M is closer to DFW and not really by that much. Well 150 miles. Nice work in this thread RME. We will have to stretch the almost-200 miles to almost-300 miles—picking up Dallas, Shreveport, KC, St. Louis, Memphis. And we really need to find a way to get into Houston. So our circle needs to be more like an ellipse. But look at the top schools, they'll always have some key guys from way out. Bama's reach is from New Jersey to Hawaii. If we can be solid in our 300 mile radius, then get a few outsiders (someone from Mississippi, Tennessee, Florida like Alex Collins) we'll be okay. Nice work in this thread RME. We will have to stretch the almost-200 miles to almost-300 milespicking up Dallas, Shreveport, KC, St. Louis, Memphis. And we really need to find a way to get into Houston. So our circle needs to be more like an ellipse. 300 miles puts DFW (322 Miles) right in the ballpark. We've always had some success here. There's no reason Morris can't step that up. Not that far in a Trans Am. Thank you all to the guys who like this stuff. I wanted to find a cleaner way to show each other school's radius but the other software I was finding looked really messy with the overlapping circles. But I do think this is interesting as it pertains to our location to major cities/fertile recruiting ground compared to that of our competitors. It's always discussed ad nauseam on this board, but now we can actually see it laid out in front of us. There's no doubt that we need the state of Arkansas to produce good recruits. Or maybe that's what happens when a pretty normal Arkansas class plays for a coach who can maximize their abilities. Hopefully the Hogs have another one, I look forward to finding out. It would be interesting if population density and demographics could be added to the chart, e.g., via shading. Well done. This has been a wondeful logical post to follow. Either work harder or move the campus to Texarkana...then we will be all over Texas and Louisiana. Aggies gonna ag. That being said they have to compete with Texas and OU and now others in the little 12. Now however they have the SEC and facilities just as good as Texas to try to attract those recruits that went primarily to Texas before. Now can anyone tell us how many "blue chip" recruits came out of each SECW teams circle of 192 miles? There is going to be the answer to the question. It is not just the distance, but DIFFERENCE MAKER type recruits within that circle. Isn't that pretty obvious and the inferred point? I think it's common knowledge that there are a lot more difference makers in the circles of A&M, LSU, Auburn, etc. than there are in the state of Arkansas over to OKC and up to KC. The circles just physically show it for the first time that I've seen on this board. So once again the Hog Farmer failed to recruit well enough regardless of the talent available. Problem with DFW is that yeah, we're the second-closest SEC school, but it's also in UT, OU, and OSU's radius and it's the center of TCU's radius. Nice thread and a lot of good information. I think you can safely extend the circle to a 500 mile radius. The biggest thing that I see in that data is that top recruits are becoming increasingly willing to travel further away and are less and less likely to stay close. Meaning, proximity is becoming less and less of a factor. With technology and video calls and os on, it's easier on people to be farther away from their family is something I'd guess plays a role in that. 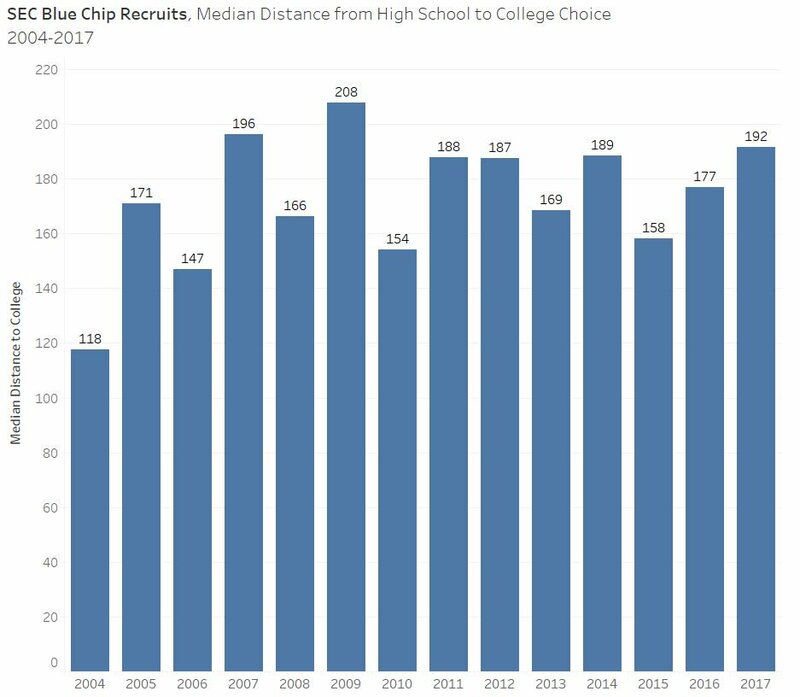 The good news for us is that it means that top recruits are going to be increasingly more likely to come here rather than go to their local school. However, as we've seen with some of our top players, they are less likely to go to the UA simply because it's the premier local school. We Played Like A Wild Band of Razorbacks! One thing that was really interesting to me looking at the 500 mi. radius was the number of P5 programs within 500 mi. of the hotbed recruiting areas. Atlanta, for instance, has 21 P5 schools within 500 mi., but Dallas has 10, and Houston 7. That says a lot about the change in emphasis in our recruiting focus. Check this out to find the high schools that produce the most talent. How many 4 and 5 star guys are in our radius for the 2019 class? I’d venture to guess that most of the others if not all have more. Yeah, I'd say that's not shocking at all. There's a lot of talent in FL/GA for sure, but there's also a lot of quality options for those kids to pick a college from. Distance is definitely a factor. The plus side for us is that west of the Mississippi everything is more spread out anyway. There is plenty of talent in Texas and not a whole lot of quality colleges that are within a 192 miles (or 500 for that matter) of where the talent is. I think we can get the recruits we need if we stay in our lane. Recruiting the southeast is an uphill slog for us though. Well yeah I agree, but even though Texas has more HS players than any state in the country, it seems like Florida produces more FBS players. Still, we don't need them all, we just need a few and while our better battle is in Texas, we would be remiss to not spend time in Florida/the southeast as well. How many 4 and 5 guys in our radius do the recruiting services know about? Kansas City and St. Louis are not that much of a necessity for us. I have often maintained the following is all we really have to do. 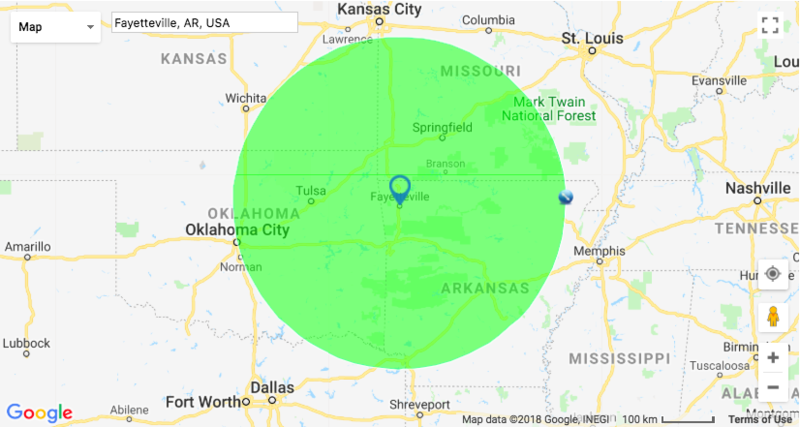 You missed a JC in northeastern Oklahoma that is closer than all the rest and produces just as many P-5 players, Northeastern A&M Jr. College in Miami, Ok.
How much talent could the UofA pull from these states. Same could be said for every area. Closest area that produces enough talent is Dallas, which is outside of that radius. You’d think KC would be good but they haven’t been. Tulsa is decent but you’re fighting OU and OSU. Same with OKC. St. Louis is decent but it’s not like we are going to pull 5+ kids a year out of there. We should be doing a better job in Memphis. Looking at that graph it's easy to see how Auburn is sitting on a goldmine covering practically the entire state of Georgia and into Florida. Good job RME. We all know this in our heads but it really comes to life when it is splayed out on the screen. Tip of the hat to you, cuz.